Exquisite bands of pink, purple and white shower this cushion cover with modern flair. 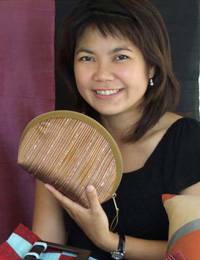 Designed by Thailand's Achara Plengsawang, they are sewn of luxurious silk. "When we started up our workshop, I got a little cat and I took good care of her, always talked to her and asked her to help me accomplish many things, which have come true." "I'm Achara Plengsawang, and ever since I can remember, I've always wanted to design and make dresses. However, my parents didn't approve of it, and instead suggested hairdressing, but I didn't like it. I got a university degree and worked in different companies doing administrative tasks, but I was frustrated because I wasn't using my creativity – I was just following my boss' orders. "Born on August 27, 1975, I am one of four siblings, though two are from my stepmother. I believe I come from a warm family environment, and they supported my decision to quit my job and pursue my dreams. "I studied Thailand's clothing industry, past and present, and began to hone on my favorite materials and items. I believe Thai silk reigns over all textiles, I love it's sheen and the softness of its textures. "As I began on this venture I met a German man who worked in the clothing industry. I feel very lucky because we get along very well and decided to work together. We have also become life partners. "We began our venture in 2004, specializing in silk. I love to design dresses and accessories, and the styles I create feature a blend of classic and modern Thailand. A team of seamstress and weavers of hill tribe origin make my designs come true. They are renowned for their sewing abilities and by working together I feel I contribute to their communities. We get along very well, and I know I can count on them because we regard each other as members of a big family. "We hope to broaden the materials we use in the future. For now, our main focus is silk handbags, but we also work clothes and other accessories. I love designing, I use everything I see, from traditional Thai art to modern, international trends, from nature, and from traveling. "I also have always loved cats, I believed them to be more than companions. I think they are like mystical friends that bring me what I ask for. Many people might think this is weird, but I have proof. When we started up our workshop, I got a little cat and I took good care of her, always talked to her and asked her to help me accomplish many things, which have come true. She's had a few kittens and recently, one of her male sons just added six more kittens to our cat family! I'm very happy taking care of them, for I know that they will only bring good things to me, such as good customers or good partnerships. I'm sure that my cats are telling me that I have come upon a good opportunity."